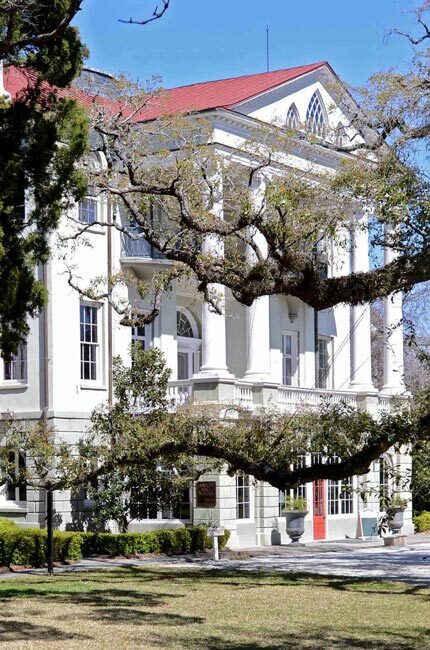 Now part of an elite preparatory school for girls called Ashley Hall, this Regency-style home in downtown Charleston was built between 1802 and 1816 for Patrick Duncan, a successful tallow chandler, or candle maker. Duncan purchased the lot on which the building stands in 1798 from Daniel Cannon, the carpenter and landowner for whom the surrounding neighborhood, Cannonborough, is named. In 1807 Duncan purchased the adjacent lot to the south from Elizabeth Combe. Duncan sold that property to James Nicholson in 1828. Nicholson owned the home until 1838, when he sold it to James R. Pringle. Pringle served Charleston as intendant, or mayor, from 1830 until 1831. Prior to his term as mayor, Pringle was elected to the South Carolina House of Representatives form 1808 through 1813 and the South Carolina Senate from 1814 until 1819. The home was purchased in 1845 by merchant George Trenholm and later owned by Charles Witte. In 1909 the elegant building and property became Ashley Hall School, founded by Dr. Mary Vardrine McBee. The academy served as both a boarding school and day school until 1974, when Ashley Hall transitioned exclusively to a day program. The school is known for its high academic standards and serves students from preschool to high school. Notable graduates of Ashley Hall include author Madeleine L’Engle, Class of 1936; former First Lady Barbara Bush, Class of 1943; and author Josephine Humphreys, Class of 1963. (Ashley Hall School) Constructed ca. 1816, Ashley Hall was once the home of wealthy Charleston merchants. Distinctive architecturally, it has served since 1909 as a preparatory school for girls. James Nicholson owned the property from 1829 to 1838. In 1838 James Pringle bought the house. Pringle was a prominent Unionist during the Nullification controversy and a member of the state legislature from 1808 to 1818. At the time he bought the house, he was the collector of customs for the Port of Charleston. Pringle sold the house to George A. Trenholm in 1845. Trenholm was a wealthy merchant and financier who became Secretary of the Confederate Treasury in 1864. The Classical Revival building was constructed of stuccoed brick painted white and is two stories over a high basement with rusticated masonry. The portico is supported by four giant-order unfluted Ionic columns with Renaissance capitals in Palladian stance upon balustraded pedestals. The pediment is denticulated and has in it triptych Gothic windows. The basement’s front elevation has a central segmented arch flanked to either side by a semicircular arch. Originally open, the arches have been glazed. The portico façade is a deeply-convex apse with second story balconies and wrought iron railings. The water table is sandstone. After decades of use as a private residence, Mary Vardrine McBee found[ed] Ashley Hall in 1909, a preparatory school for girls. Dear Ms. Hay, thank you for the correction concerning the school’s use prior to 1974. We have updated our article. The sentence to which you refer, which contains a “dangling modifier and a grammatical error,” was not written by us but appears in a quotation provided by the National Register. Finally, we were happy to add “Dr.” in front of the founder’s name, but please note that both Ashley Hall’s official website and you yourself do not refer to her as “Dr.” but as “Miss.” I am sure neither you nor the school meant any disrespect, and nor did we. Correction: the school was. NOT exclusively a boarding school until 1974. It accepted both day and boarding students until 1974, when it became exclusively a day school. Other notable graduates: two authors in the class of 1951- Nancy Friday and Sandra Braid (Alexandra Ripley). Finally, the last sentence would make Miss McBee turn over in her grave – both a dangling modifier and a grammatical error (“After decades of use as a private residence, Mary Vardrine McBee found Ashley Hall in 1909”). And by the way, she should properly be referred to as Dr. McBee. Ashley Hall was NOT exclusively a boarding school until 1974. I attended the school for 12 years and graduated in 1953. Also, the Class of 1953 had a book published about this house with interior photos, etc. It was researched, written and published by Ian MacDonald in 2005. The school should have a copy of this book.